Today, the “Jayhawk” is the official mascot of the University of Kansas. Today, the term “Jayhawk” most often refers to a mythical bird of Kansas. It is utilized as the University of Kansas’ mascot and often applied to anyone from the state, However, a different type of Jayhawker was very real during the Kansas-Missouri Border War and continuing into the Civil War. The term was first known to have been used in 1849 by a group of California bound travelers passing through Kansas who called themselves Jayhawkers. The term was thought to have been inspired by a cross between a hawk and a blue jay, taking on the predatory habits of the former, and the noisy nature of the blue jay. By the 1850s, the term was widely accepted in the region as anyone from Kansas. When the new territory was opened for settlement in 1854 and was flooded by both anti-slavery advocates and pro-slavery residents, mostly from Missouri. Tensions were immediate between the opposing factions, which soon led to the Kansas-Missouri Border War, often referred to as “Bleeding Kansas” in the years prior to the Civil War. Liking the tough image the term conveyed, Kansas soldiers continued to use the term and members of the Seventh Kansas regiment, commanded by Colonel Charles R. Jennison, were widely known as Jayhawkers. 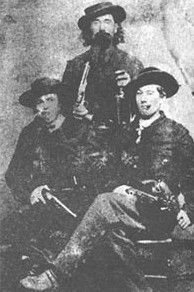 Jennison’s troops, who wore red breeches, were also referred to as “Redlegs.” Other prominent Jayhawkers of the time were the renowned politician, James H. Lane who commanded what was known as “Lane’s Brigade,” and Daniel R. Anthony, an ardent abolitionist and the brother of suffragette Susan B. Anthony. In many cases, true Jayhawkers and Redlegs refused to join units officially sanctioned by the U.S. Army; however, guerrillas on both sides of the Missouri-Kansas border achieved some measure of legitimacy through sanction from the Federal and Confederate governments. 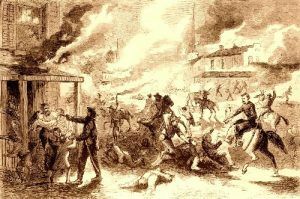 Two years later, when William Quantrill attacked Lawrence, Kansas in August 1863 in what has become known as the Lawrence Massacre, Confederate guerillas could be heard shouting, “Remember Osceola!” Though Lane was in residence in Lawrence at the time, he was able to escape the attack by racing through a cornfield in his nightshirt. As the Civil War continued and the Jayhawk raids diminished, the ruffian image gave way to a patriotic symbol and Kansas Governor Charles Robinson raised a regiment called the Independent Mounted Kansas Jayhawks. By the end of the war, Jayhawks were synonymous with the impassioned people who made Kansas a Free-State. Today the term continues to apply Kansas natives and serves as the University of Kansas’ mascot. Compiled and edited by Kathy Weiser, updated November 2018.